If you’ve ever considered your options for treatment of depression or anxiety using pharmaceuticals and/or integrative approaches, we wanted to offer an educational essay on some of the comparisons of consideration from the perspective of what happens chemically and biologically in the body. Mental health, as an attribute of the state of health, can branch into many conditions, disorders, and disturbances with a very broad number of diagnoses. The clinical definition of a mental health disorder according to the Diagnostic & Statistic Manual (DSM) is, “a syndrome characterized by clinically significant disturbance in an individual’s cognition, emotion regulation, or behavior that reflects a dysfunction in the psychological, biological, or developmental processes underlying mental functioning.” (DSM) An individual’s diagnosis of a mental health disorder can evolve throughout an individual’s life, but overall, the most common diagnoses for mental health conditions fall into the categories of depression and anxiety. The World Health Organization has announced that Depression is now the #1 Illness, with 300 million people worldwide suffering from this condition. (Depression) Clinical symptoms of depression include a depressed mood on a daily basis, a diminished sense of pleasure in activity, weight loss or gain, lack of sleep, agitation, feelings of restlessness, fatigue, feeling unworthy, and recurrent thoughts of death. Trataka is a meditation based on a single point of focus, such as a candle, the moon, a face or an image. Following is a guided meditation honoring the tradition of Judaism following the 5 levels of the soul. As I feel into and notice the sensation of stress in my body, it is like a panorama of sensations exploding and expanding from within. In any given day, we experience stress in multiple formats coming at us from multiple people through varied situations: lack of a good night of sleep, muscle pains from lumpy mattress or kids kicking us out of our bed, guilt over not making time to meditate or exercise, not enough hot water for a shower, cherrios box empty, grouchy spouse, kids not getting ready for school fast enough, work projects unfinished…whew! and it’s only 8 am! Now that’s a dramatic replay of distressing types of stress, and certainly not every morning is like this, but let’s consider eustress, the good type of stress. Eustress can still affect the body, but it tends to be as a result of positive events: marriage, having a baby, hosting a party, interviewing for a job, asking for a raise, competing in a sporting event, networking or social engagements….eustress allows us to have focused energy in a short amount of time, it motivates us and it usually is tied to a favorable end result allowing for change and growth. Symptomatically, both types of stress can feel like…tightness in the chest, butterflies in the belly, heart racing, the body releasing cortisol and adrenaline, the body ready to react and to move into action…The Stress Response or, Fight and Flight, is being activated, and the sensations you feel are real and varied! It is all of these processes combined, along with a minimum of over 20 additional reactions and changes, both internally and externally, that result in the “stress” we feel in our body. When we say we are stressed, it is not just removing “stress” in the body, but rather a combined effort of alleviating the panorama of symptoms of all of these bodily processes. 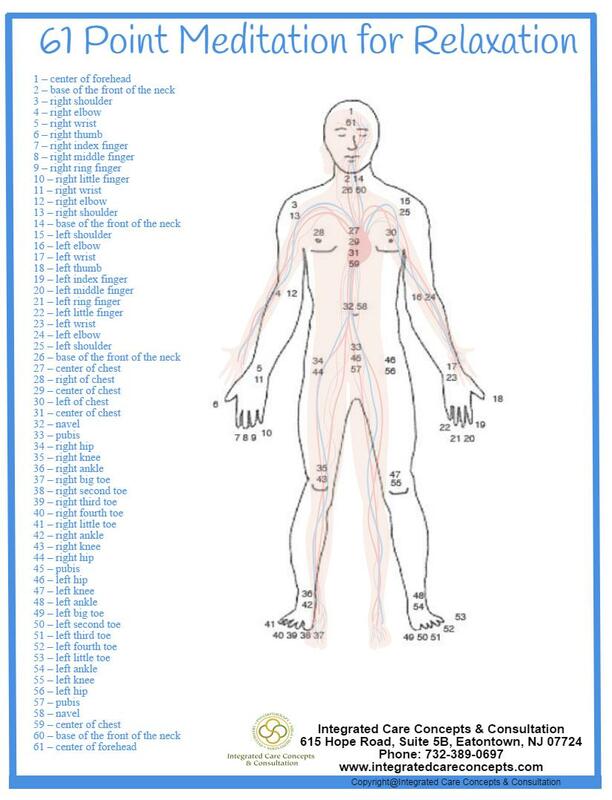 Try out this 61 point meditation for relaxation that draws on the science of the veda’s and the marma points of the body. Attached is an audio recording and a worksheet download for you to follow. As you try out the meditation and notice the points on the body, see what it may feel like to just notice each point as you move through the meditation, and then comparatively, try tapping along each of the points using your pointer and index finger of either your left or right hand on each of the points.